One of the things I really enjoy about Christmas is seeing all the unique items that come out specifically for the holiday. It never ceases to amaze me just how creative individuals can get with things they are passionate about in order for them to fit into the Christmas season. 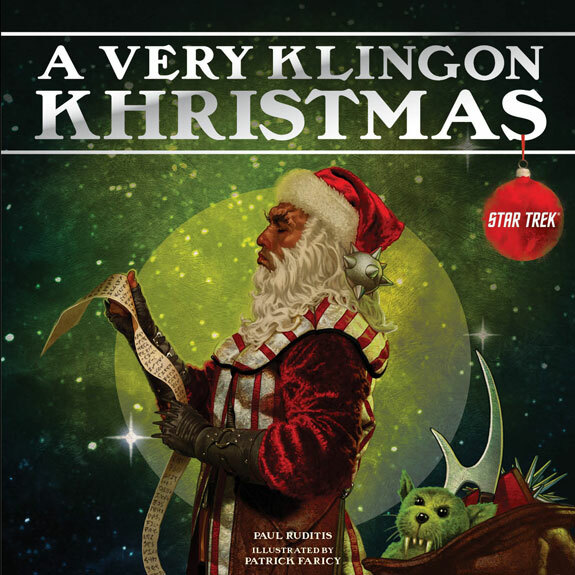 I recently read the book A Very Kling Khristmas, and it is definitely one of those creative works by an avid Star Trek fan named Paul Ruditis that manages to combine his love for Star Trek to the Christmas season. The book is kind of a Klingon version of Twas the Night Before Christmas. Now I’m sure there are people who are saying geeky! There are others saying Klingons don’t celebrate Christmas. And there are a few whose eyes lit up when they read Klingon Khristmas. Yes, this review is for you! First of all I like Star Trek. It’s a fun world, but the Klingons really aren’t my favorite part of that universe. But this book has broaden my horizons on Klingons just a little bit. Like I said earlier, the book is written in the manner of Twas the Night Before Christmas. The book is also the size of a children’s book so it’s easy to read through, and it has great illustrations by Patrick Faricy. It explains why Klingons celebrate the birth of Kahless, and how they believe that Khristmas was stolen by humans. And then it tells how the Klingons celebrate this season. If you are not into the geek world do not get this book to read, you won’t like it. And if you’re kind of on the fringe of the trekkie world you will find it entertaining. And if you’re a trekkie boldly go where no man has gone at Khristmas.